Welcome to my Testimonials page. Here you can read comments from some of my wedding couples. I’d be delighted to hear from you and receive feedback. – With gratitude, Rabbi Spike. Thank you again for officiating our recent marriage. From the “pre-marriage” sessions for you to learn about us and our homework, we learned a lot about ourselves, our relationship and why we wanted to get married. Most importantly, we learned that we were truly meant for each other. You also took the time to teach us about the many meaningful traditions of a Jewish wedding. We wanted an intimate, meaningful ceremony and that is exactly what you were able to help us achieve. We could not have been happier with the experience. Rabbi Spike is amazing. We are so incredibly thankful to him for making our wedding and the conversations leading up to our wedding even more wonderful than we could have ever imagined. Before we got married Rabbi Spike spent time with us talking about our relationship, Judaism, and the wedding ceremony. His guidance helped us craft the exact experience we were hoping for. We both have busy lives and Rabbi Spike worked with us to set up times to talk that were convenient. He was also incredibly accessible and responsive when we had questions. Rabbi Spike is a great listener. Because of this his words at the ceremony were personalized, meaningful, and thoughtfully crafted; and his charming style added to the experience. In the days, weeks, and now months since the wedding people continually tell us how special our ceremony was and how memorable the words of our rabbi were. Thank you Rabbi Spike. We couldn't have picked a more perfect rabbi to marry us! When we first got engaged and started discussing who would marry us, we were unsure where to begin. Our families belonged to two different Temples in Atlanta but neither one of us really knew the current Rabbis at either Temple. We decided to reach out to Rabbi Spike first and there was never any question from that point on about who would marry us. From the moment we met him we instantly felt comfortable and at ease. Pre-marital counseling sounds official and intense and we did not really know what to expect. Rabbi Spike took the time to truly get to know us and during our meetings with him we had meaningful and emotional conversations. We looked forward to our time together and also enjoyed the “homework” he gave us between meetings. Wedding planning can be crazy and stressful and he helped keep us focused on the love we have for each other and beginning the next chapter of our lives together. Our wedding day would not have been the same without Rabbi Spike. When we arrived at the venue he greeted us with smiles and hugs and his joyful spirit matched what we were feeling and the vibe we wanted in the day. He immediately made it a point to meet our families and they were instantly drawn in by him as well. During our meetings with Rabbi Spike before our wedding we honestly did not discuss our ceremony too much and what it would entail. One of our homework assignments had been to write letters to each other and send them to him without showing each other. Little did we know that Rabbi Spike would use those letters to form the framework of our ceremony. We absolutely loved this as it made our ceremony so personal and intimate. We did not want to write our own vows but it was really special hearing Rabbi Spike using words we had written to each other to guide our ceremony. Months after our wedding we still have people talking about how much they liked our Rabbi and how beautiful they thought our ceremony was. Our wedding day was the happiest day of our lives thus far. We are so happy Rabbi Spike was a part of it and hope to share many more happy moments in the future with him. Rabbi Spike was AMAZING to work with as we prepared for our wedding. We met in person several times and our 'homework' ended up being what Spike used during the ceremony. Spike challenged us to write our own wedding vows and encouraged us to use family heirlooms during the ceremony. We made our own chuppah, signed the Ketubah DURING the cermony, and included our parents and siblings around the chuppah. Spike spoke so beautifully and made the ceremony something we will always treasure. Everyone loved that he stayed for a bit to schmooze and so many people have raved about him after the wedding! We are honored that he married us and continues to be OUR rabbi! me. Being an out of town couple, we didn’t have a temple affiliation. My cousin reached out to Rabbi Spike and made the introduction on our part. From my initial reaction, Rabbi Spike was easy to get in touch with and was extremely quick with his responses. whether it was during our conference call session or in-person in his office. of the day was during the prayer for the woman when everyone sang the prayer and included spirit fingers. The signing was the perfect way to start our wedding and set the tone for a fun night. ceremony and interacted with the guests. hearing from our family and friends about how great our ceremony was. Rabbi Spike made our ceremony special and unforgettable! Rabbi Spike was absolutely amazing! From start to finish, he guided us through the discussion about our marriage, walked us through the significance of the ceremony and helped us choose exactly how we wanted it to work. After all that, he gave us the most beautiful ceremony we could have possibly asked for, and his words gave it more significance than I could have imagined. A deep and sincere thank you to Rabbi Spike, and an unreserved recommendation if you are considering him for your own wedding. Rabbi Spike Anderson was truly a pleasure to work with - not only was he an incredible mentor to us during our wedding process but was also extremely kind, spiritual and thoughtful. He conducted a truly magical ceremony for us, one that we will be forever grateful for. We cannot thank Rabbi Spike enough for creating such a beautiful and memorable ceremony for us. Thank you Rabbi Spike! We got married in October 2014 and Spike made our ceremony "one of the most beautiful" according to our friends and family. It was rich with personal stories and he really made our guests feel like they were a part of our special day. We really enjoyed our meetings with Spike before our wedding and many important parts of our conversations were reflected in the ceremony. We could not have asked for a more dedicated person to marry us and we could not have asked for a more perfect wedding ceremony. Thank you again! Thank you Rabbi Spike for everything you did for us for the wedding. The wedding perfectly reflected our personalities and our love for each other. The ketubah signing was our favorite part of the wedding, as it was so personal, intimate and spiritual. We truly felt all the love and positive energy from our friends and family as we entered into this new phase of our lives. It will be a moment we will cherish forever. We knew from the day we met that one day in the future, we would be taking the plunge. We also knew that, at the helm, would be Rabbi Spike. There were so many questions, so many things to debate. But having Spike as our officiant was a must. In our opinion, Spike is the only Rabbi we knew that would be able to handle all of our requests. We aren't religious at all, but we did want a Jewish component in our rite of passage. It was a second wedding for both of us. Neither one wanted a big to do. We wanted to stress the importance of family because that's what our union is about...us and our five children. Spike was amongst the first people we shared the news of our engagement with. Once we officially committed, we wanted to wed as soon as possible. Spike had requested that we read a book on Jewish weddings and meet with him three times before the wedding. As you may be able to imagine, two full time jobs and five kids doesn't leave too much time for anything else. To top it off, we live in Agoura (30 minutes from Stephen S. Wise with no traffic). But that's why Spike was the perfect man for our job. He allowed us to really work around our hectic schedule and distance. He even allowed us to have some conference calls as our meetings which was really, really helpful. As mentioned earlier, we both had been there, done that. So why did we need to have meetings and read a book on Jewish weddings? That being said, we chose Spike for a reason and decided to go with his recommendations and do exactly as he said. Our trust in him was rewarded richly with a deeper understanding of the ritual in which we were about to partake and in the vows we were about to promise. The wedding itself was, as our eight year old said recently, "the most fun night in the world". Spike did an amazing job honoring all of our quirky requests. He went with the flow of our super non traditional wedding, just the two of us and our brood of five in our home (which, again, isn't around the corner). Spike made it the family event that we wanted. He was really able to teach our children all about what it was we were doing, the importance, and it's holy nature. He was even able to reign in the little ones by incorporating them in the ceremony on the fly. Thank you, Spike. We are forever grateful to you for making our day wonderful, but even more so, for making us an official family. As early as the first meeting that my husband, James, and I had with him we were able to see how genuine, wise, funny and open he was. 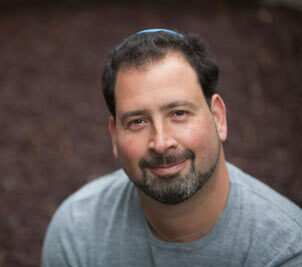 At every one of our meetings Rabbi Spike took the time to get to know us as individuals and as a couple, learn about our connection to each other, and our relationship with Judaism. James and I genuinely enjoyed our meetings with Rabbi Spike and he did a great job of helping us to prepare for the next chapter in our lives as husband and wife. Additionally, it was important to us that we understand the rituals and what they meant so that on the wedding day we didn’t feel as though we were simply “going through the motions”. Rabbi Spike did an INCREDIBLE job of having open dialogue with us on the various parts of the ceremony and rituals. He found ways to explain them in the traditional sense and in a way that resonated with us personally so that we were able to connect with and apply it to our own relationship and journey. The result of this was a beautiful, spiritual and personalized ceremony that will last in our memories forever! I can’t tell you how many people have told me how much they enjoyed our ceremony and it is all because of Rabbi Spike! We are so grateful that we were fortunate enough to have met him and we hope that our wedding is one of many happy occasions that we celebrate with him! Where do we begin? Rabbi Spike Anderson was an amazing choice to have officiate our wedding. He is such a decent man with a huge heart. We were referred to him by a friend and are so happy that we were. We instantly connected with Rabbi Anderson. Each time we visited with the Rabbi we learned more about one another as well as ourselves. He is a great listener. When we would meet with him to prepare for our wedding we felt like he would put aside all of his other responsibilities and direct his attention to us. As if we were the only thing that mattered. This was so important to us. The day of our wedding Rabbi Anderson made us feel very calm and relaxed. The ketubah signing ceremony was so beautiful and we felt very connected as a couple. Then before we knew it we were walking down the aisle and ready to get married! We had a few technical difficulties that came up such as the groom's bow-tie falling off and not having enough room to circle each other 7 times as well as a fire engine roaring by. These small errors had nothing to do with Rabbi Spike. Yet he handled these unexpected issues by improvising and was cool as a cucumber making sure that we moved on gracefully. Thank you for that Rabbi. We felt so comfortable up there on the most important day of our lives and we know a big part of that was the way you handled everything. We cannot thank you enough. Its less than a week before our wedding….excitement and emotions are running high! We come to realize that due to a simple misunderstanding, our Previous Rabbi will not be able to make it to our wedding in time. Ok so now the panic sets in. How will we find a Rabbi to Marry us in just 5 days!? A recommendation was given to call Stephen S. Wise Temple. After speaking with the staff at Stephen Wise we receive a much appreciated call back from Rabbi Spike Anderson. He had heard about our situation and wanted to help. That same day we were in his office meeting with him and it couldn't have gone better. Instantly we both felt a connection. Rabbi spike took his time to get to know us and opened up to allow us to get to know him as well. Not only was he kind and caring but he was very organized and thoughtful. Five days later we had a wedding and it was wonderful! Rabbi Spike brought tradition, emotion, wisdom and humor all in one perfect package. Even though we had only know him for a few days it was as if we had a long standing history with each other. Even our guests commented (and still comment) on how great a Rabbi we had and when we tell them this story they are in disbelief! They always thought that based upon the dialogue he gave that at least one of us had know him for years! In the end we couldn't have been happier with the way everything played out. Not only was Rabbi Spike able to step in and help us in our time of need but he did such an incredible job and will be in our wonderful memories forever! Thank you again Rabbi Spike and looking forward to many more happy occasions! We looked for a long time for our Rabbi. It had to be right – after all, my husband and I are both from different corners of the country, and we didn’t know any Rabbi’s in LA. When we saw Spike’s picture, we knew he was the one. There was a special soul behind those eyes, and someone we knew would hold the sacredness of our love, and our day, in the highest regard. We could not have been more right about that special soul! Rabbi Spike made us feel like welcomed friends each time we met. He honored us with the way he spoke about our connection, and the history of our relationship. He calmed us when we didn’t know how to navigate the territory of mentioning loved ones lost during our ceremony. He was a guide, a confidante, and a trusted companion on our wedding journey. One of our homework assignments leading up to the wedding was to read a book about Jewish weddings. There is one paragraph from the book that I will always remember. In essence, a great wedding is not one where you walk away talking about the party or the fun you had. A great wedding is one where you walk away knowing in every fiber of your being that the two people who were married belong together. Rabbi Spike honored us by highlighting our love to everyone present. The day of, I swear that the light of everything holy was shining down upon us. Rabbi Spike, and the golden late afternoon sun, enveloped us all. Each one of our guests commented that our love had elevated them on that day, and reminded them of what truly matters in life. Spike is undoubtedly one of the most wonderful, heart centered, and wise men that we have ever met. We were so fortunate to meet and to know him, and to have him officiate on our wedding day.